In a facility as large as a hospital, your best bet is going to be a wireless synchronized clock system, in which individual clocks stay in sync by receiving a radio signal from the master controller as opposed to connecting via wiring. A quality wireless system will have a signal strong enough to easily cover a facility as expansive as a hospital, all while avoiding interference with medical equipment by using its own radio frequency. Always consider the size of your facility when picking out a synchronized clock system. In a facility the size of an average clinic, for instance, an investment in a master controller may not be warranted. In that case, IP network clocks may be the best choice. 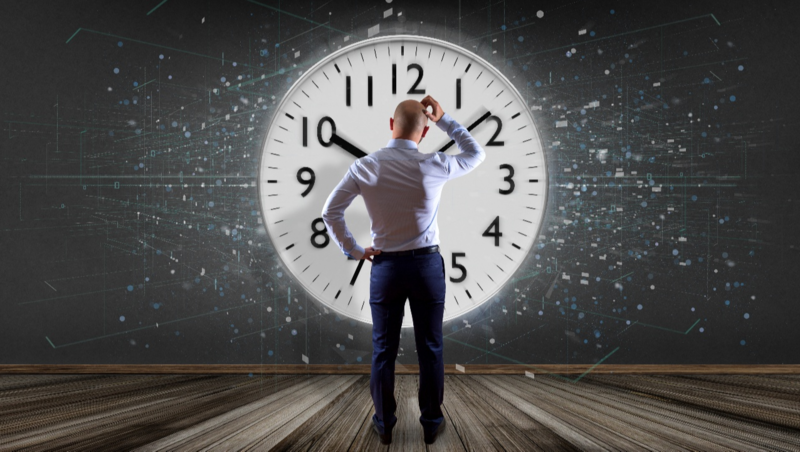 IP network clocks don’t receive a time sync signal from a master controller, but instead, connect directly to your LAN or WLAN to receive a time signal with no need for other equipment. American Time has two kinds of IP network clocks available: Wi-Fi or Power over Ethernet (PoE). Once you've selected your clock system, you'll need to decide between analog and digital displays. Analog is less expensive, but digital is easier to read from greater distances or low-light areas. In a hospital, a mix of formats will likely be the wisest choice. Analog displays should suffice for hallways and commons areas while operating rooms will benefit from the visibility of a digital display. Digital can also come with enhanced functionality. In a hospital, make sure your clocks come with a time-elapsed setting that allows staff to track how much time has gone by during a specific task. This can prove vital during time-sensitive surgeries. In a clinic, though, where the environment is less urgent, the analog format should be fine. Compared to hospitals, K-12 schools present a different set of challenges in timekeeping. Namely, they require a system that can be integrated with the daily bell schedule. That means you'll need a system that uses a master controller which creates and “controls” a wired or wireless network of clocks. Choosing between wired and wireless depends on the status of your building. For new construction, a wireless clock system presents the ideal option due to the flexibility and ease of integration it offers. Otherwise, if you are outfitting a pre-existing building that already has a wired clock system installed, pick a clock model that's compatible with the existing master controller. American Time's AllSync Plus® clocks, for instance, work with most of the old controllers. On the flip side, if your old master is dying, but the original wired clocks are working, you can purchase a hybrid master that works with both wired and wireless clocks. This way you can replace your wired clocks as they die gradually, instead of replacing them all at once. It’s a popular and budget-friendly option. If you're selecting a synchronized clock system for a college or university, you have a different set of factors to consider. Since those institutions of higher learning don't typically operate on a bell system, you don't have to rely on a master controller, meaning IP network options such as Wi-Fi or PoE clocks should serve your purposes. IP network clocks should also adequately serve a production facility. In this sector, though, you need to carefully consider your display format. Office settings do fine with analog, but digital is most suitable for a factory floor because of it's enhanced readability, making it easier for personnel operating heavy equipment to keep track of the time while doing their job safely. Wi-Fi clocks will likely be a sound choice for restaurants and hotels, offering synchronized time with little fuss. Just connect the clock to your Wi-Fi network and hang it where needed, no master controller required. You'll have to replace the batteries approximately every five years, but beyond that, you won't have to give your Wi-Fi clocks a second thought. They'll stay in sync with the official time — as set by the National Institute of Standards and Technology. So just like when you’re browsing the cereal aisle, there are many options that will accomplish the same goal. With synchronized time, you can select IP network systems such as Wi-Fi or PoE, or choose a system with a master controller and go either wired or wireless. Or better yet, you can have the best of both worlds and go with a hybrid system like American Time’s SiteSync IQ®. Still not sure what clock system is best for you? We’re here to help. Schedule a clock consult with one of our clocks advisors. Otherwise, feel free to read our guide.